Here’s a peak at the latest sidewalk mural at Extra Place, set to be officially unveiled this Saturday. “Music Machine,” painted by Buenos Aires-born, New York-based street artist Sonni in his trademark primary colors, picks up the theme of his 30-foot acrylic-on-metal mural “Boom Box,” which was the toast of Miami’s Art Basel festival in 2010. 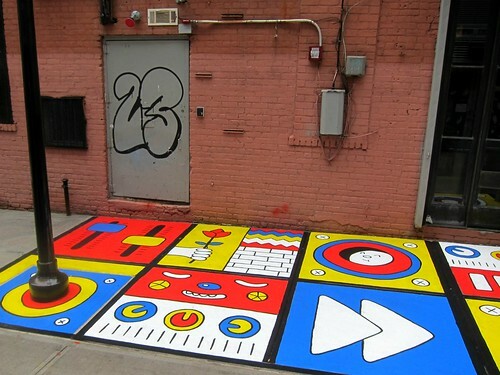 It’s the second exhibit at Artist Alley @ Extra Place, which – like last week’s mural behind La MaMa – is a collaboration between Fourth Arts Block and Murals Around New York. A reception for the work will be held Saturday at 2 p.m. at Oaxaca Taqueria at the end of Extra Place, which is located mid-block on East First Street, between Bowery and Second Avenue. You can see more of Scott Lynch’s photos in The Local’s Flickr group.